Words can empower, motivate, words attract, elevate, demean, alienate, haunt and kill. Words can do all of them and none at all. Blessed with the power of wielding words, should we ask for more? We hear and speak words every day for the reason that we heavily rely on them to communicate. Because of this, words play a very important role for shaping our beliefs and perception of reality. It is estimated that the average person speaks more than 7,000 words per day. Even though we hear and speak words every day, most of us have no clue as to how powerful words are. We can weave magic through words. The magic emanates from the etymology itself. English has grown by accepting all the languages it encounters. Amalgamation of languages like Latin, German, French and Sanskrit reinforces the impact of Words. English is changing way too fast, but not losing the touch of the languages which have now become obsolete. On heart and mind, that’s tender. Words can inspire, and words can destroy. Words should always be used wisely. Infosys Toastmasters Bhubaneswar hosted it’s 431st session on the theme, “The Power of Words.” The meeting started with the SAA TM Debasish explaining the mandatory rules, followed by TM Panchanan, the club President throwing some light on how important words are, and once said, they can’t be taken back. TM Debasish, the MOC of the day, brought in some fantastic stories from his childhood, and explained how powerful words can be.It is a strange mystery – the power of words, and we noticed some very good wordplay in the prepared speeches.TM Madhurima, completed her CC-10 entitled “Impaired yet Empowered”, where she persuaded the audience to help the impaired in whatever way possible. 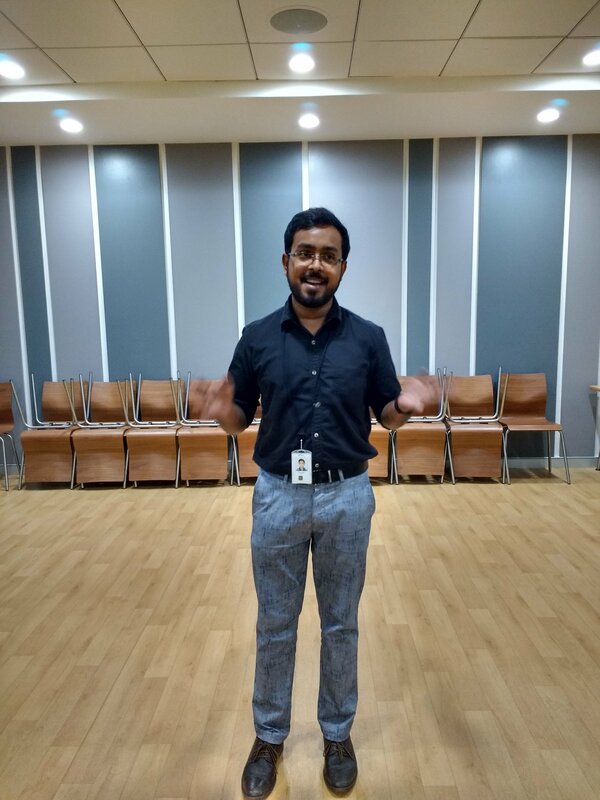 TM Souramya completed his CC-4 entitled “Between Infinity and Me”, where he discussed on ways to attain spirituality. 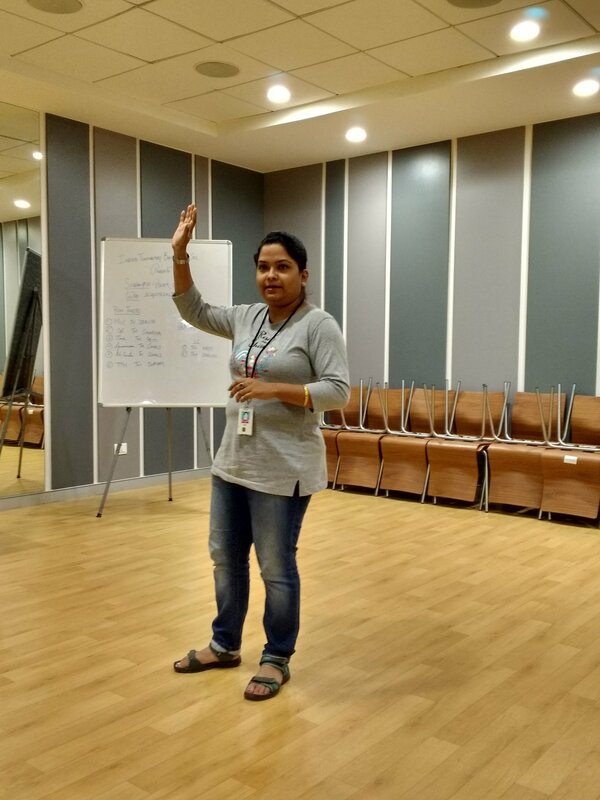 An interesting table topics session was hosted by TM Jayanta, who took up the role for the first time, and yet performed brilliantly. 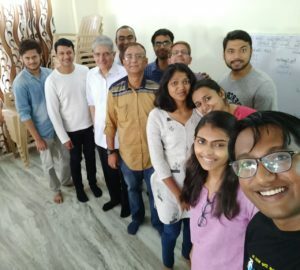 The evaluations were led by the general evaluator TM Soumojit, who with his set of evaluators, TM Avantika and TM Chinmoy as the speech evaluators, and TM Anurupa, TM Krishna and TM Vikas as the Ah-counter, Grammarian and Timer did an appropriate evaluation of the entire session. The highlight of the day were the heart-touching prepared speeches and the table topic speech by TM Avantika, who was admired by all the guests that finally won her the Best Table Topic Speaker award. The session ended with a mandatory photo session. 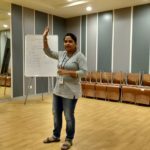 Meeting no.172 started with our SAA TM Shilpi who stated the mandatory rules to be followed during any Toastmasters meet. 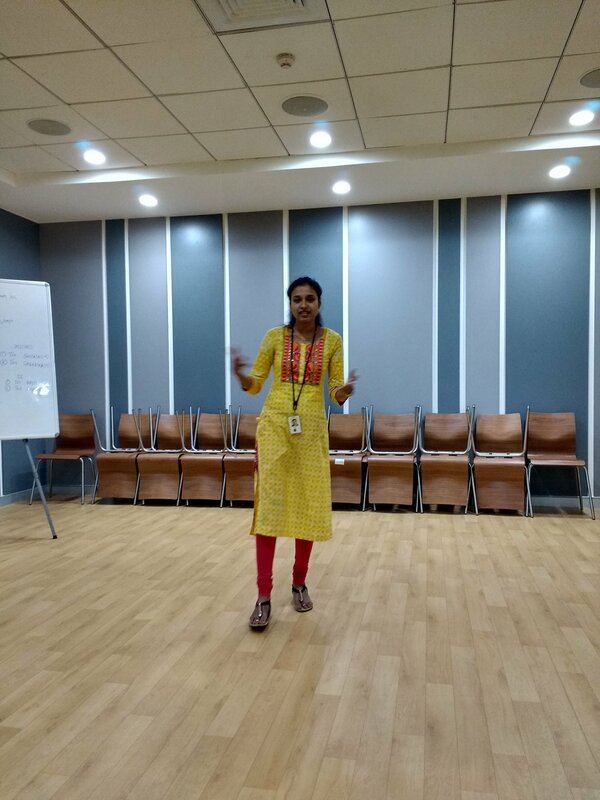 Acting President TM Medha explained how Toastmasters provides a safe haven for the people to express their thoughts and views in a time where you get trolled for your every other update on the social media. TMOD TM Lovely brilliantly carried out the theme of the day with interactive games and sessions with the audience. 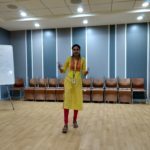 Everyone was asked to write down some motivating words on chits of paper and the members were further called on the stage to dedicate those inspiring words to their fellow Toastmasters, which brought a smile on many faces. Speaker 1 TM Sridevi gave her Ice Breaking speech with her life story. Speaker 2 TM Partho talked about nuclear wars and portrayed himself as a cockroach man, taking this grave matter in his hands, or rather wings. Speaker 3 TM Amrita stated how it is equally important to respect men in the race of gender equality. TM Sandeep delivered his ALB Project 2 with the Moments of Truth and asked the members to appreciate and give points of suggestions for the club to run at its best. 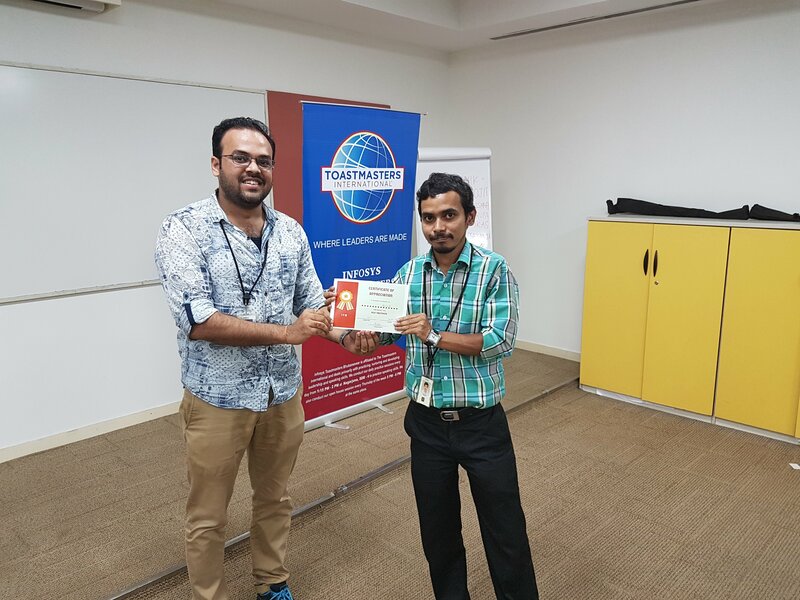 TM Ashish unleashed the super powers of the guests as the Table Topic Master. General Evaluator TM Arindam along with his Three Musketeers’ TM Medha as Ah-Counter, TM Neha as the Timer and TM Rohit as the Grammarian carried out the evaluation session. The Speech evaluators TM Sony, TM Tahira and TM Sheeraz gave feedback to their respective speakers. Felicitation of Competent Leadership Certificate to TM Sheeraz and Competent Communicator Certificates to TM Rohit and TM Sandeep was done at the end. 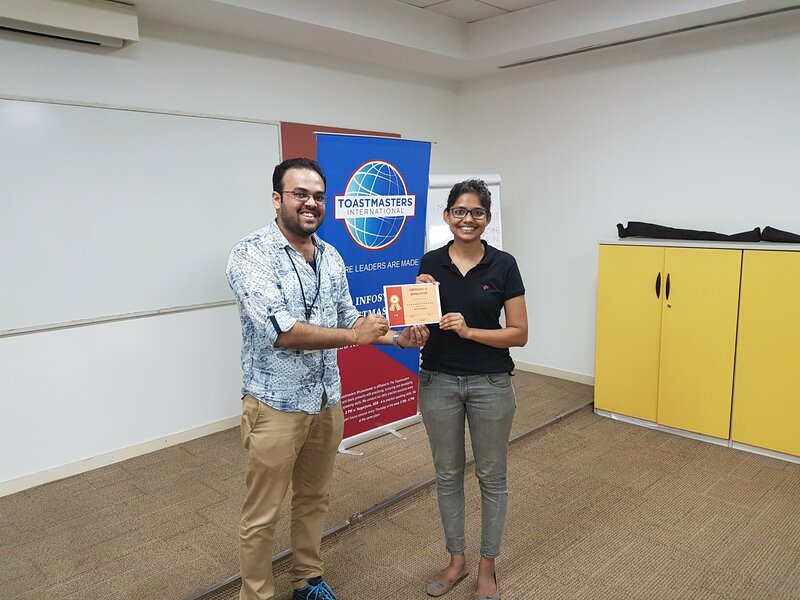 TM Medha wins an award for her contributions as the Division PRM and Insteel Toastmasters successfully renewing 20 members before time, was celebrated with sweets and smiles. The meet came to an end with group photos and declaration of the winners of the day. 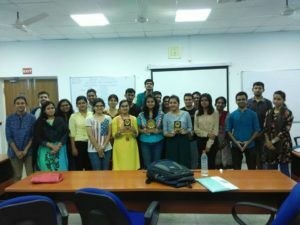 The 19th meeting of North South University Toastmasters Club was held at Audi 801 of North South University with the theme of “Power of Words”. The venue became full of life as soon as the members and guests started coming in. President Dr. Katherine Li opened the meeting at 6 pm by welcoming the members and guests followed by the Invocation Speech of Maria Rahman on the Theme of the Day. President handed over the meeting to TMOD Amena Akhter. 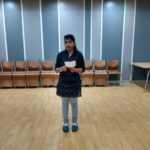 She gave a short introduction of herself and theme before allowing the General Evaluator, Rokhsana Akhter to introduce her team. The Grammarian introduced the word of the day ‘ADEPT’. By announcing the end of introduction, the general evaluator handed over to the TMOD. The Toastmaster came on the stage to introduce the speakers of prepared speech. Md. Salam Bin Shawkat, delivered an inspiring and heart touching speech titled “We Live to Live Like You” from CC Manual Project 4. The speaker took all the attentions of the audience by staring with some acts and finishing by delivering a message. 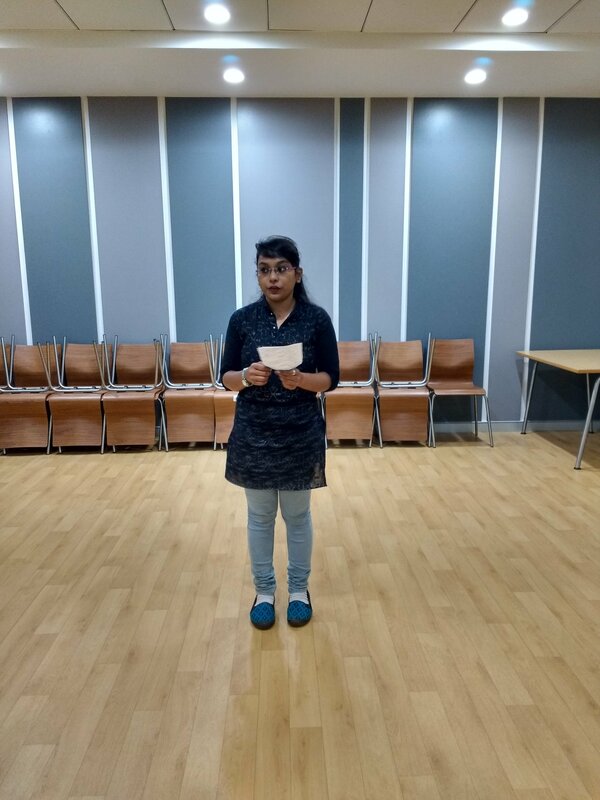 Next, was another amazing emotional Ice Breaker Speech by the second speaker, Anusha Rouf, entitled “When life gives you lemon, you make Lemonade” and talked about some of her struggles she faced in life. The most interesting part of the meeting started shortly after the prepared speeches when the toastmaster of the evening called on stage the table topic master, Md. Mufad Haidary. The table topic master conducted the table topic session where the audience took part with great enthusiasm. Four table topic speakers took part in this session. With some interesting table topics and impromptu speeches, the Table Topic Master handed over the meeting to the TMOD. TMOD called the general evaluator to conduct the evaluation and reporting session. Evaluators and reporters gave their feedbacks and reports on the prepared and impromptu speeches. The Evaluation session was concluded by the General evaluator by giving out her own report. The meeting was then handed over to TMOD who called the President and Ballot Counter to announce the winner’s name and present them with certificates. 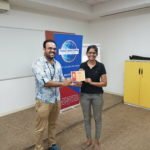 The Best Speaker Award went to Anusha Rouf, Best Evaluator Kazi Rafshan Hasin and Ms. Suhara Hussain bagged the award of the Best Table Topic Speaker. President closed the meeting by making a toast and thanking everyone for being a part of the meeting and our trademark group photo was taken. 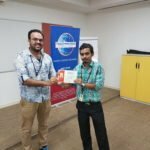 Infosys Toastmasters Bhubaneswar SEZ conducted a session on the theme, “Power of Words” on 12th October 2017, marking its 60th session. The session began with MOC of the day ‘TM Shalini Dash’ reading out the club’s mission as well as reiterating the last session details. She explained about the theme, stressing on the fact that words are singularly the most powerful force and can be either the make or break of humanity. She then invited the General Evaluator ‘TM Sagarika Dash’ and her team: Grammarian and Ah-Counter ‘TM Somali Mallick’ and Timer ‘TM Priti Verma’. Prepared Speeches by ‘TM Smita Pati’ and ‘TM Sagarika Dash’ were delivered. The word of the day was ‘Sesquipedalian’, which means polysyllabic or long word. 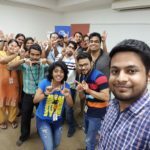 Keeping the theme in mind, TM Swayam Sarkar, then took up the table topics session. He began the session by quoting the speech by Marc Anthony in William Shakespeare’s Julius Caesar which brilliantly shows persuasion by words. The table topics were thought provoking and made the speakers talk about personal anecdotes, where words had inspired them to dream. 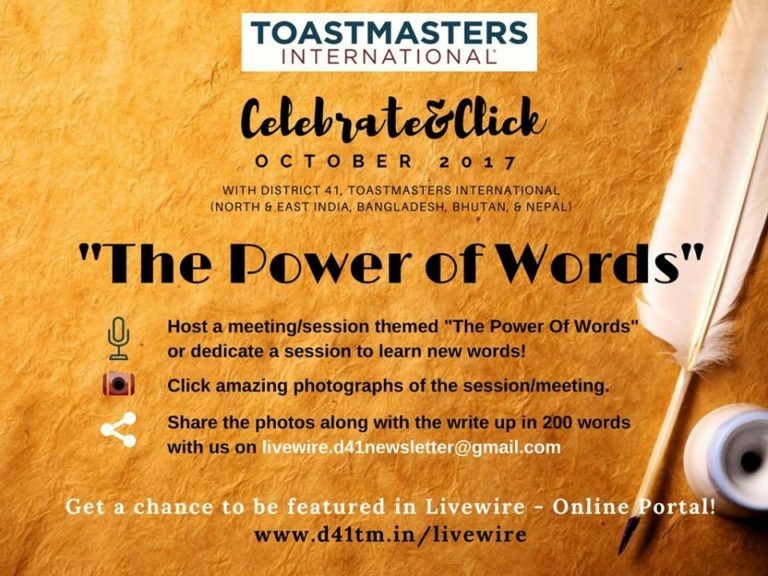 On 20th October 2017, I called Nafees Kausar, VP Education of Dhaka Toastmasters Club, informing them to organize their next meeting with the theme, “The Power of Words “, thus, obliged. 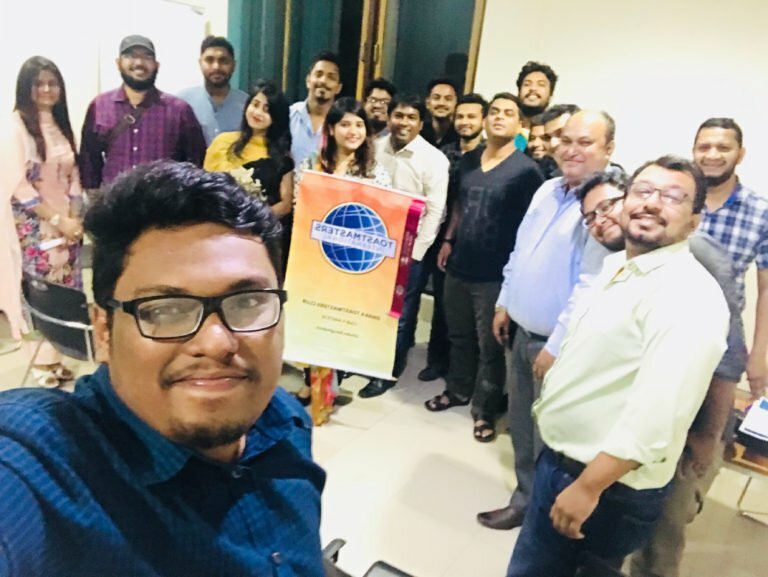 On 21st October 2017, Dhaka Toastmasters Club held their meeting with the theme, “The Power of Words”. North South University Toastmasters Club always shared a great deal of friendship with Dhaka Toastmasters Club, so I and our VP Education, Salam Bin Shawkat visited them with our guests, including Mithun Das Kabbo, Director of Gorbo Bangladesh. It was a windy day after days of rainfall, which made us all have a pre-meeting tea time in the terrace of Bishwa Shahitto Kendro. The President of Dhaka Toastmasters, Mohammad Zahid told me to be the Toastmaster of the Day due to the absence of their TMOD and Salam Bin Shawkat as the Grammarian. The meeting had three prepared speeches, two speakers gave their speeches from CC Manual and the other speaker gave his speech from ALB Manual Successful Club Series. The table topic session was humor filled with seven table topic speakers. The meeting has seen some top-notch evaluation by Nafees Kausar and Mohammad Zahid. In the award giving ceremony, Tasneem Huq won the Best Speaker Award, her mentor and evaluator Nafees Kawsar became the Best Evaluator and Arpon became the Best Table Topic Speaker. 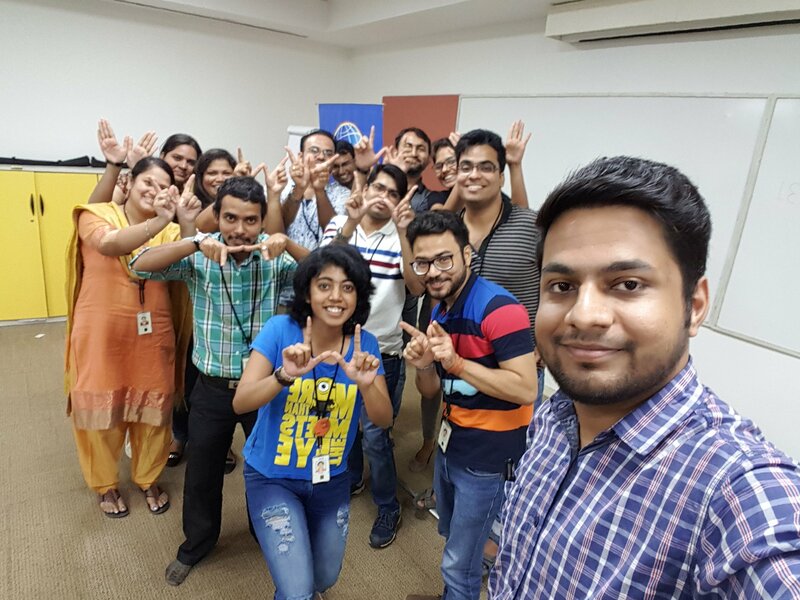 In the end, as usual I took the trademark selfie to cherish and make the meeting memorable. 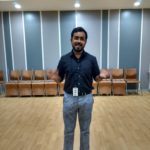 I, Kazi Rafshan Hasin, Sergeant at arms of North South University Toastmasters and this is my story of a windy and enjoyable meeting of Dhaka Toastmasters Club.